"These pieces of battered chicken are crispy and succulent, and hard to stop eating! They're so good that they will give your local Chinese restaurant a run for their money. 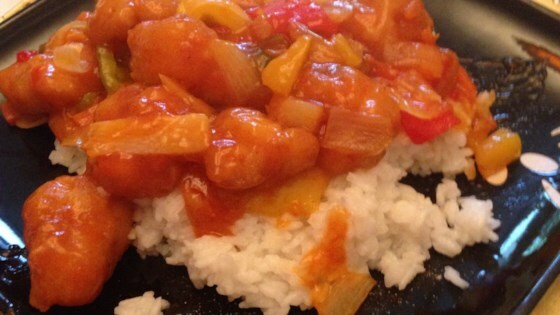 Enjoy with rice and sweet and sour sauce." Mix flour, baking powder, and salt together in a bowl. Drizzle in sesame oil. Gradually add water, whisking constantly until smooth; batter should be the consistency of cream. Let sit for at least 30 minutes. Fill a deep pan or wok with oil and slowly heat to 375 degrees F (190 degrees C). Mix cornstarch and white pepper together in a large shallow dish. Dust chicken in the cornstarch mixture and dip into the batter, evenly coating each piece. Transfer to the hot oil in batches and fry until golden and no longer pink in the center, 4 to 5 minutes. Scoop fried chicken out with a slotted spoon. Drain on a clean kitchen towel. Repeat with remaining chicken.